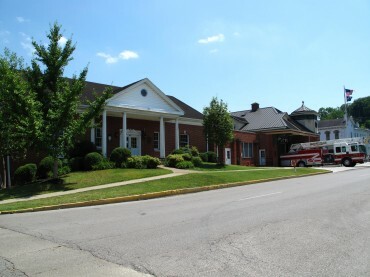 The Maysville Municipal Building, at 216 Bridge Street, houses City Administration, Codes Enforcement, Planning and Zoning, and Projects Manager at the Bridge Street entrance, as well as Fire Station 1 and the Maysville Utility Commission, entrances at the rear. City Administration includes the City Manager, City Clerk, Human Resources, and Financial Offices. Maysville Police Department is located just one block west of the Municipal Building at 212 Government Street. In addition to Fire Station 1, the Maysville Fire Department has a second station on Kenton Station Drive and a training facility on Martha Comer Drive. The fire department provides fire protection services within the city limits and ambulance coverage throughout Mason County. The Maysville-Mason County Visitors Bureau, and Main Street Director are housed in the historic Cox Building at the corner of Third and Market streets in the heart of downtown Maysville. The Cox Building and Maysville Conference Center, on East Second Street, are venues for meetings, weddings, and other events. The Public Works offices and garage are located at 1720 Martha Comer Drive. Public Works provides a number of services including street maintenance, trash collection, public transit, park maintenance, and events set-up. The City of Maysville has a city manager form of government pursuant to KRS 83A.150.